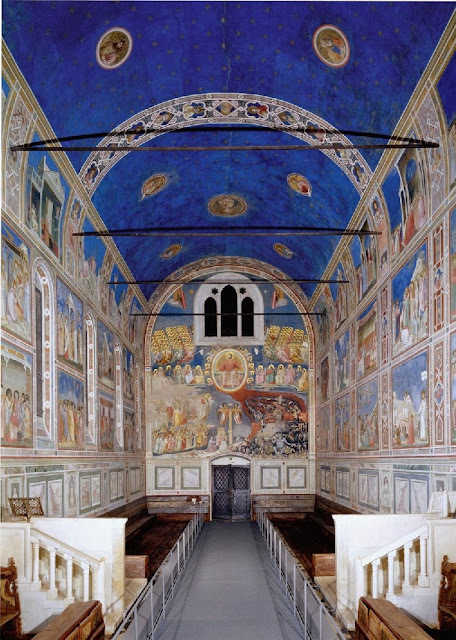 Frescos and ultramarine ceiling, Giotto 1306. In his fifteenth century handbook for painters, Cennino Cennini said, "Ultramarine blue is a color illustrious, beautiful and most perfect, beyond all other colors; one could not say anything about it, or do anything with it, that its quality would not still surpass." The ancient Egyptians used ultramarine to decorate the sarcophaguses of their pharos. Later, Marco Polo reported that it was made at a lapis lazuli mine in Afghanistan. Its name alludes to these far-flung origins: ultra-marine = "beyond the sea." Venetians were probably the first in Italy to learn the extraction technique and import the raw lapis. Producing the rich blue pigment from the rock was no simple task; success required an elaborate set of steps. Because of the difficulty, for a time, an ounce of ultramarine was valued more highly than an ounce of pure gold. In the legal contracts drawn up for commissioned paintings, patrons often stipulated exact amounts of the precious material for the artist to use. Beyond its beauty, its presence in a painting signaled the wealth of its owner. Take fragments of lapis lazuli, which you can find plentifully in Venice and at low prices. Get fragments that are nicely tinted a pretty celestial color and remove any poorly tinted fragments. Cull the nicely colored fragments into a pot and put it amongst hot coals to calcine. When they are inflamed throw them in fresh water and repeat this twice. Then grind them on a porphyry stone most impalpably to become like sifted grain flour. Take equal amounts, three ounces each, of pine pitch, black tar, mastic, new wax and turpentine, add one ounce each, of linseed oil and frankincense. I put these things in a clay bowl to warm on the fire until I see them dissolve and with a stirring rod, I mix and incorporate them thoroughly. This done, I throw them into fresh water, so they will combine into one mass for my needs. For every pound of finely powdered lapis lazuli, ground as described above, take ten ounces of the above gum cake. In a bowl over a slow fire, melt the gum, and when it is well-liquified throw into it, little by little, the finely powdered lapis lazuli. Incorporate it thoroughly into the paste with a stirring rod. 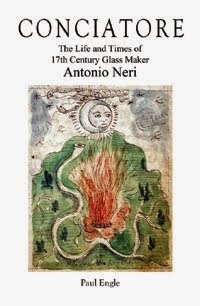 Cast the hot incorporated material into a vessel of fresh water and, with hands bathed in linseed oil, form a round cake, proportionately round and tall. You should make one or more other of these cakes from the quantity of the material. Then soak these cakes for fifteen days in a large vessel full of fresh water, changing the water every two days. In a kettle, you should boil clear common water and put the cakes in a well-cleaned, glazed earthen basin. Pour warm water over them and then leave them until the water has cooled. Empty out the water and pour new warm water over them. When it has cooled, pour again, replenishing the warmth. Repeat this many times over, so that the cakes unbind from the heat of the water. Now add new warm water and you will see that the water will take on a celestial color. Decant the water into a clean glazed pan, pour new [warm] water over the cake and let it color [the water]. When it is colored, decant it and pass it through a sieve into a glazed basin. Pour warm water over the cake, repeatedly until it is no longer colored. Make sure that the water is not too hot, but only lukewarm because too much heat will cause the blue to darken, hence this warning, which is very important. Pass all this colored water through a sieve into the basin. It still has the unctuosity of the gum, so leave it to stand and rest for twenty-four hours; all the color will go to the bottom. Then gently decant off the water with its unctuosity, pour clear water over it and pass it through a fine sieve into a clean basin. Pass the fresh water through the sieve with the color stirred-up so that this color still passes through and therefore a great part of the filth and unctuosity will remain in the sieve. Wash the sieve well and with new water again pass the color through. Repeat these steps three times, which ordinarily leaves all the filth on the blue resting in the sieve. Always wash the sieve each time, cleaning it of all contamination. Put the blue in a clean pan. Gently decant off the water and then leave it to dry. You will have a most beautiful ultramarine, as I have made many times in Antwerp. The amount per pound of lapis lazuli will vary. It depends on whether the lapis has more or less charge of color and on the beauty of its color. Grind it exceedingly fine on the porphyry stone, as described above and you will succeed beautifully. For a quite beautiful and sightly biadetto blue that mimics ultramarine blue, take ordinary blue enamel and grind it exceedingly fine over the porphyry stone, as above. Incorporate it into the gum cake with the dose described above and hold it in digestion in fresh water for fifteen days as with the lapis lazuli. Follow the directions for the lapis lazuli, in all and for all, until the end. These blues are not only useful to painters, but they also serve in order to tint glasses par excellence.